The research project is managed by the Collection of Sculptor before 1800 at the Musuem of Fine Arts, Budapest, the Wigner Research Center of Physics and the Center of Energy Research at the Hungarian Academy of Science. A comprehensive technical investigation has been performed on the statuette called ‘Budapest Horse and Rider’ attributed to Leonardo da Vinci. This small bronze of the Budapest Museum of Fine Arts was taken first in 2017 to the Csillebérc campus of the Hungarian Academy of Sciences to carry out non-destructive experiments at neutron beam instruments of the Budapest Research Reactor in order to collect new information on the inside of both parts, the horse and the rider of the object and eventually learn more about the casting technique used. This small bronze horse, also often called the ‘Rearing Horse’, was analyzed in 2009 by the conservators of the Washington National Gallery of Art together with two other similar horse figures, one from The Metropolitan Museum in Art in New York and the other from The Hunt Museum in Limerick, and the thorough technical examination led the researchers to the conclusion that the Budapest bronze was most probably cast in the early sixteenth century, while the two others are late copies from the nineteenth century. The X-ray radiography images recorded in Washington already revealed that the bronze was made by indirect casting technique. The main aim of the Budapest neutron research was to provide new insight into the inner structure of the bronze and to reconstruct the process of casting as much as possible using high-resolution neutron imaging. 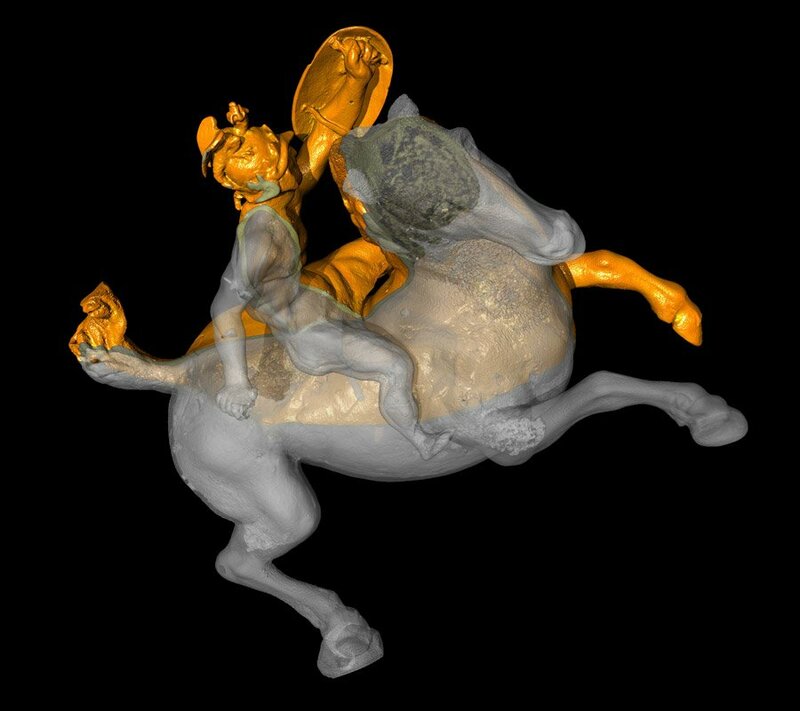 The 3-dimensional (3D) neutron tomography measurements were able to provide high-quality images of the inside of the small bronzes (both horse and rider) with a precision of a tenth of a millimeter. These neutron transmission experiments also visualized traces of the core material, which remained inside the objects after the lost wax casting process. The results of this first neutron experiment generated further questions, inspired new investigations, thus a second series of measurements was undertaken on the bronze in September 2018. Applying other neutron-beam instruments at BNC, additional features of the materials and the cast could be revealed. The element composition of the remnants of the core-material inside the bronze - observed by the 3D tomography - was also examined by prompt-gamma spectroscopy and neutron diffraction. Besides the characterization of the core material, the physicists have performed the elemental composition analysis of the bronze alloy not only at the surface (as in the Washington study) but also in the bulk of the material on the horse, rider, and the horse tail. The purpose of these measurements was to determine the eventual differences of the cast parts made separately. These results prove unambiguously that the horse and the rider were cast from the same bronze material, but the casting process was different. At the Budapest Neutron Centre of the Hungarian Academy of Sciences, neutron-based methods are being used for the characterization of archeological objects and artworks since the late nineties. Various neutron techniques, being non-invasive and non-destructive methods, are highly demanded by museum research experts and conservators. Such experimental studies of Cultural Heritage artefacts or archeological objects are performed in close collaboration by researchers of the Nuclear Analysis and Radiography Department (Centre for Energy Research) and the Neutron Spectroscopy Department (Wigner Research Centre for Physics), operating a suit of 15 spectrometers at the Budapest Research Reactor. The experimental techniques using neutron beams extracted from the reactor can serve three fundamental purposes: (1) bulk elemental composition analysis (prompt gamma activation analysis), (2) imaging (neutron and X-ray radiography and tomography), moreover (3) bulk phase and texture analyses of crystalline or amorphous materials together with microscopic or nanoscale structural determination (neutron diffraction and small angle scattering). BNC provides a world-class ensemble of neutron experimental facilities and the related expertise, thus has became an internationally acknowledged center for complex non-invasive materials research services in the field of Cultural Heritage science. Neutron-based methods can also be complemented by many other laboratory techniques on the Csillebérc campus, such as laser spectroscopy, proton beam X-ray analysis, electron microscopy etc. Summary of the neutron tomography carried out in the Wigner Research Center of Physics in 2017. Images and video animations of the 2017 neutron tomography.